1Department of Microbiology, Faculty of Public Health, Mahidol University, 420/1 Ratchavithi Road, Phayathai, Ratchathevi, Bangkok 10400, Thailand. 2Naval Medical Department, Royal Thai Navy, Bangkok 10600, Thailand. 3Department of Environmental Health Science, Faculty of Public Health, Mahidol University, Bangkok 10400, Thailand. *Address correspondence and reprints request to: Pipat Luksamijarulkul, Department of Microbiology, Faculty of Public Health, Mahidol University, 420/1 Ratchavithi Road, Phayathai, Ratchathevi, Bangkok 10400, Thailand. Liksamijarulkul P, Aiempradit N, Vatanasomboom P. Microbial Contamination on Used Surgical Mask among Hospital Personnel and Microbaila Air Quality in their Working Ward: A Hospital in Bangkok. Oman Med J 2014 Sep; 29(5):346-350. The disposable masks including surgical masks and N95 were originally developed to filter droplets containing microorganisms expelled from the mouth and nose. It was introduced by World Health Organization (WHO), and National Institute for Occupational Safety and Health (NIOSH) to protect the patients or HCWs from the risk of various respiratory infections.12-14 But some factors should be considered, especially the selection of a mask, which has different pore sizes to filter particles for preventing the spread of air-borne pathogens and the mask used behaviors.15-18 Hospital personnel, especially nurses are at risk to acquire the infection during nursing care and coming in contact with patients. Evidences showed that the surgical mask might not be enough to protect the person from air-borne pathogens and might also be the source of air-borne or droplet infection.15,19,20 This study aimed to investigate the microbial contamination on used disposable surgical masks among hospital personnel and microbial air quality in their working wards and its relationship. These are useful in developing prevention and control programs among HCWs. A cross-sectional study was conducted to assess the bacterial and fungal contamination on 230 used surgical masks (Face mask ear-loop 3 Ply US FDA 510 K) from 214 hospital personnel. The inside and outside area of the masks were analysed. The partakers were males and females aged ≥18 years, and have voluntarily participated and signed the consent form. Furthermore, 215 indoor air samples were collected from their working wards in the same days during the 2-month observation to investigate the microbial air quality (bacterial and fungal counts). The study was conducted with the ethical approval of the ethical committee of Mahidol University (Reference No. MU-IRB 2009/ 130.2306). A total of 215 indoor air samples were collected from the participants working wards including: 40 samples from male medical ward, 35 samples from female medical ward, 38 samples from emergency room (ER), 47 samples from operation room (OR), 31 samples from intensive care unit (ICU), and 24 samples from out-patient department (OPD). Sampling was done during 12:00 to 15:00 p.m. every Monday, Wednesday and Friday for two months using the Millipore Air Tester to assess bacterial and fungal counts. Air sampling collection points includes nurse station, central area of patient room and patient bedside, and the examination room. The nurse station has air conditioner, while the patient section is naturally ventilated and supplemented with electric ceiling fans for better air circulation. The temperature in the nurse station was about 25ºC, and the patient room was about 31º to 34ºC. Data were analyzed using descriptive statistics including percentage, mean and standard deviation (SD) for describing bacterial and fungal counts. Paired t-test was used to compare between mean of microbial contamination on outside and inside areas of used masks. The correlation between bacterial and fungal counts in air samples collected from working wards and the loads of bacterial and fungal contamination on the used masks was analyzed using Pearson’s correlation coefficient. The significant level was set at p<0.050. Analysis of 215 indoor air samples collected from the studied wards revealed that the OPD had the highest bacterial and fungal mean counts (576 ± 254 cfu/m3 and 263 ± 219 cfu/m3; respectively). While the intensive care unit had the lowest bacterial mean count (38 ± 8 cfu/m3) and the operation room had the lowest fungal mean count (19 ± 7 cfu/m3). Air samples collected from OPD, male and female medical wards had relatively higher average bacterial and fungal counts than those collected from the other wards. Moreover, isolated bacteria and fungi were preliminarily identified; it was found that the predominant bacteria and fungi were Staphylococcus spp. (57%) and Penicillium spp. (39%) and Aspergillus spp. (31%), respectively. Details are shown in table 3. 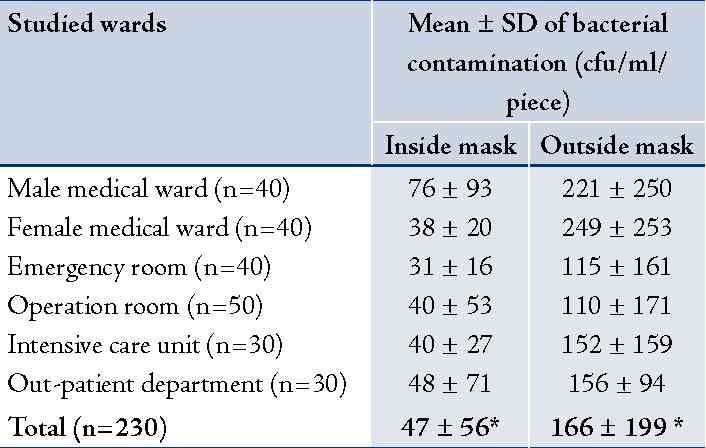 Table 1: Bacterial contamination on used surgical masks (cfu/ml/piece) by studied wards: inside and outside areas of the used masks (n = 230). Remarks: Most isolated bacteria from inside areas were Staphylococcus spp (34%) and Pseudomonas spp. (34%), and most isolated bacteria from outside areas were Staphylococcus spp (40%) and Pseudomonas spp. (37%). Table 2: Fungal contamination on used surgical masks (cfu/ml/piece) by studied wards: inside and outside areas of the masks (n = 230). Remarks: Most isolated fungi from inside areas were Aspergillus spp (37%) and Penicillium spp. (31%), and most isolated fungi from outside areas were Aspergillus spp. (43%) and Penicillium spp. (25%). Table 3: Means and standard deviation of bacterial and fungal counts of air samples collected from studied wards. Remark: Most isolated bacteria were Staphylococcus spp. (57%) and most isolated fungi were Penicillium spp. (39%) and Aspergillus spp. (31%). The correlation between bacterial and fungal counts in air samples collected from working wards and the microbial contamination loads on the used masks (inside or outside area) was analyzed. It was found that bacterial and fungal counts in air samples showed significantly positive correlation with the bacterial contamination found on outside area only of the used masks (r=0.16, p=0.018 and r = 0.21, p=0.003; respectively). The details are shown in table 4. 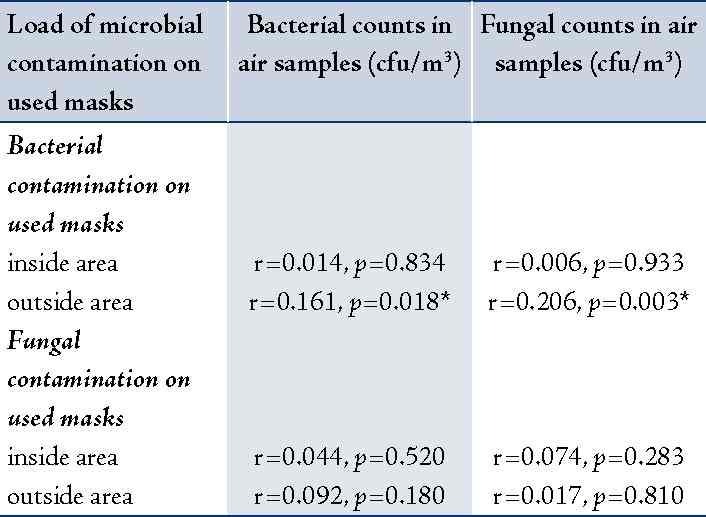 Table 4: Pearson’s correlation coefficient between bacterial and fungal counts in air samples and load of microbial contamination on used masks (inside and outside areas). 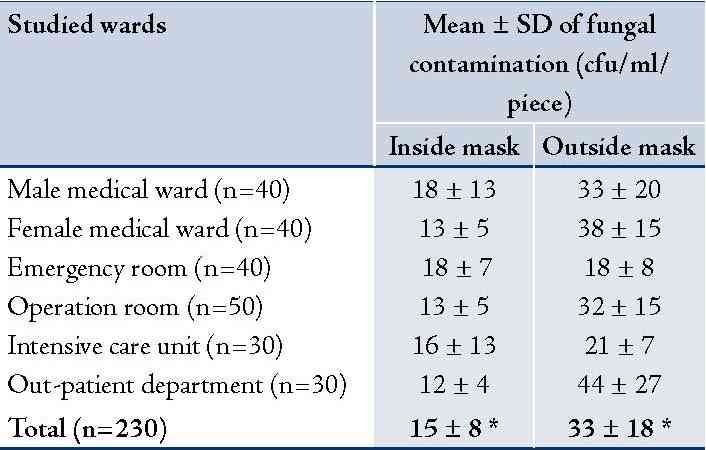 This study was a short-term assessment of bacterial and fungal contamination on the used surgical masks among hospital personnel and microbial air quality in their working wards. The disposable masks were originally developed to filter droplets containing microorganisms expelled from the mouth and nose, and probably to protect the human respiratory system from fine air-borne particles that are known to be associated with various respiratory diseases.12-14 WHO and NIOSH recommended the optimal types of disposable masks for different purposes. Generally, the surgical mask is designed to prevent microorganisms from the nose and mouth of the wearer from spreading to others. It is not efficient to filter particles of some infectious agents, especially M. tuberculosis and some viral particles.15 The present study found that both bacterial and fungal contamination on outside areas of the used masks were significantly higher than the inside areas (166 ± 199 vs. 47 ± 56 cfu/ml/piece, p<0.001 and 34 ± 18 vs. 15 ± 9 cfu/ml/piece, p<0.001; respectively). This evidence supported that the studied surgical masks could filter most of contaminated bacteria and fungi in air of the working wards. However, our study included only one type of surgical mask and did not detect the viral contamination. Also, some used mask behaviors probably increased the microbial contamination on the masks.22 When isolated colonies were randomly selected to identify bacterial groups/genus and fungal groups/genus by Gram’s stain and lacto-phenol cotton blue staining, respectively; it was found that the predominant isolates contaminated on the outside of the used masks were Staphylococcus aureus (41%) and Pseudomonas spp. (38%), and the most isolated fungi were Aspergillus spp. (44%), and Penicillum spp. (25%). The microbial indoor air quality assessment in this present study revealed that OPD had the highest average of bacterial and fungal counts (576 ± 254 cfu/m3 and 263 ± 219 cfu/m3), while ICU and OR had the lowest average of bacterial count and fungal count, respectively. Air samples collected from OPD, male and female medical wards had relatively higher average of bacterial and fungal counts than the other wards. This evidence was similar to the bacterial and fungal contamination on used masks. When isolated colonies were preliminarily identified, it was found that the predominant bacteria were Staphylococcus spp. (57%) and the predominant fungi were Penicillium spp. (39%) and Aspergillus spp. (31%). Similar bacterial and fungal groups were found in used masks and indoor air of the working wards. This evidence probably supported the accumulation of air-borne bacteria and fungi on the used masks. This present study revealed that the high bacterial contamination on the outside area of the used surgical masks had significantly positive correlation with bacterial and fungal counts found in air samples that were collected from the working wards. To reduce the load of bacterial contamination on the used masks, the hospital environments, especially microbial air quality in the working wards should be improved. This study was supported for publication by the China Medical Board, Faculty of Public Health, Mahidol University, Bangkok, Thailand. Finally, we would like to acknowledge the Director of the studied hospital and also wish to extend our deep appreciation to all participants in the present study. 1. Amoran OE. Occupational exposure, risk perception and access to prophylaxis for HIV/AIDS infection among healthcare workers in Northern Nigeria. Br J Med Med Res 2013 Feb;3(2):275-287 . 2. Delclos GL, Gimeno D, Arif AA, Burau KD, Carson A, Lusk C, et al. Occupational risk factors and asthma among health care professionals. Am J Respir Crit Care Med 2007 Apr;175(7):667-675. 3. Luksamijarulkul P, Khumsri J, Vatthanasomboon P, Aiumlaor P. Improving tuberculosis infection control practice and microbial air quality in a general hospital after intervention. Asian Pac J Trop Med 2009 Apr;2(2):39-46. 4. Sepkowitz KA, Eisenberg L. Occupational deaths among healthcare workers. Emerg Infect Dis 2005 Jul;11(7):1003-1008. 5. Al Jahdhami I. Latent tuberculosis in healthcare workers: time to act. Oman Med J 2013 Mar;28(2):146-148. 6. Luksamijarulkul P, Kiennukul N, Vatthanasomboon P. Laboratory facility design and microbial indoor air quality in selected hospital laboratories. Southeast Asian J Trop Med Public Health 2014 May;45(3):746-755. 7. Bennett A, Parks S. Microbial aerosol generation during laboratory accidents and subsequent risk assessment. J Appl Microbiol 2006 Apr;100(4):658-663. 8. Luksamijarulkul P, Panya N, Sujirarat D, Thaweboon S. Microbial air quality and standard precaution practice in a hospital dental clinic. J Med Assoc Thai 2009 Dec;92(Suppl 7):S148-S155. 9. Bonetta S, Bonetta S, Mosso S, Sampò S, Carraro E. Assessment of microbiological indoor air quality in an Italian office building equipped with an HVAC system. Environ Monit Assess 2010 Feb;161(1-4):473-483. 10. Tunevall TG, Jörbeck H. Influence of wearing masks on the density of airborne bacteria in the vicinity of the surgical wound. Eur J Surg 1992 May;158(5):263-266. 11. Letts RM, Doermer E. Conversation in the operating theater as a cause of air-borne bacterial contamination. Am J Bone Joint Surg 1983;65:357-362. 12. Huang C, Willeke K, Qian Y, Grinshpun S, Ulevicius V. Method for measuring the spatial variability of aerosol penetration through respirator filters. Am Ind Hyg Assoc J 1998 Jul;59(7):461-465. 13. National Institute for Occupational Safety and Health (NIOSH).42CFR 84 Respiratory Protective devices: Final rules and notice. Federal Register 60:110. U.S. Centers for Disease Control and Prevention, National Institute for Occupational Safety and Health, 1997. 14. Jensen PA, Lambert LA, Iademarco MF, Ridzon R; CDC. Guidelines for preventing the transmission of Mycobacterium tuberculosis in health-care settings, 2005. MMWR Recomm Rep 2005 Dec;54(RR-17):1-141. 15. Willeke K, Qian Y, Donnelly J, Grinshpun S, Ulevicius V. Penetration of airborne microorganisms through a surgical mask and a dust/mist respirator. Am Ind Hyg Assoc J 1996 Apr;57(4):348-355. 16. McLure HA, Talboys CA, Yentis SM, Azadian BS. Surgical face masks and downward dispersal of bacteria. Anaesthesia 1998 Jul;53(7):624-626. 17. Alwitry A, Jackson E, Chen H, Holden R. The use of surgical facemasks during cataract surgery: is it necessary? Br J Ophthalmol 2002 Sep;86(9):975-977. 18. Luksamijarulkul P, Supapvanit C, Loosereewanich P, Aiumlaor P. Risk assessment towards tuberculosis among hospital personnel: administrative control, risk exposure, use of protective barriers and microbial air quality. Southeast Asian J Trop Med Public Health 2004 Dec;35(4):1005-1011. 19. Harber P, Barnhart S, Boehlecke BA, Beckett WS, Gerrity T, McDiarmid MA, et al; American Thoracic Society. Respiratory protection guidelines. This official statement of the American Thoracic Society was adopted by the ATS Board of Directors, March 1996. Am J Respir Crit Care Med 1996 Oct;154(4 Pt 1):1153-1165. 20. Fennelly KP. Personal respiratory protection against Mycobacterium tuberculosis. Clin Chest Med 1997 Mar;18(1):1-17. 21. Larone DH. Medically important fungi: a guide to identification. 3rd ed. Washington DC: American Society of Microbiology Press; 1995. 22. Kretzer EK, Larson EL. Behavioral interventions to improve infection control practices. Am J Infect Control 1998 Jun;26(3):245-253. 23. Seitz TA. NIOSH indoor air quality investigations1971-1988. In: Weekes DM, Gammage RB, editors. Proceedings of the Indoor Air Quality, International Symposium: May 23, 1989; Cincinnati, OH: National Institute for Occupational Safety and Health; 1989 P, 163-171. 24. World Health Organization. Indoor air quality: biological contaminants. Report on a WHO meeting. WHO Reg Publ Eur Ser 1990;31:1-67. 25. Kodama AM, McGee RI. Airborne microbial contaminants in indoor environments. Naturally ventilated and air-conditioned homes. Arch Environ Health 1986 Sep-Oct;41(5):306-311. 26. Jacobs RR. Risk environments. In: Rylander R,Jacobs RR, editors. Organic dusts: exposure, effects and prevention. Boca Raton, Fl: Lewis Publisher; 1994 P, 3-15. 27. Li Y, Leung GM, Tang JW, Yang X, Chao CY, Lin JZ, et al. Role of ventilation in airborne transmission of infectious agents in the built environment - a multidisciplinary systematic review. Indoor Air 2007 Feb;17(1):2-18. 28. Tang JW. The effect of environmental parameters on the survival of airborne infectious agents. J R Soc Interface 2009 Dec;6(Suppl 6):S737-S746.